A block of rooms at the Astor Crowne Plaza New Orleans French Quarter (739 Canal Street, New Orleans LA 70130) have been reserved at the rate of $139 single/double occupancy. The deadline to receive the reduced rate is Wednesday, August 1, 2018 or until the room block fills. Call the hotel at 877-408-9661 and ask for the National Association for Rural Mental Health conference block. You can also BOOK ONLINE. Shuttle vans provide transportation to and from the airport. Shuttle vans are white with yellow lettering that says “Airport Shuttle” on its side with the phone number 522-3500. You can make shuttle reservations by visiting the link: http://www.astorneworleans.com/transportation. The cost is approximately $24 per person one way. There are also taxis available to share as well as executive cars. Visit the hotel website at http://www.astorneworleans.com/location.aspx for directions to the hotel. The hotel is approximately 10-15 minutes from the airport. Overnight valet parking is available at the reduced rate of $20 per car per night for our group at the Premium Parking lot behind the hotel on Iberville Street. Unload in front of hotel then park in Premium Parking lot. Valet parking at the hotel is $42 per night. A VITAL, FRENCH QUARTER HOTEL WHERE CANAL MEETS BOURBON STREET. 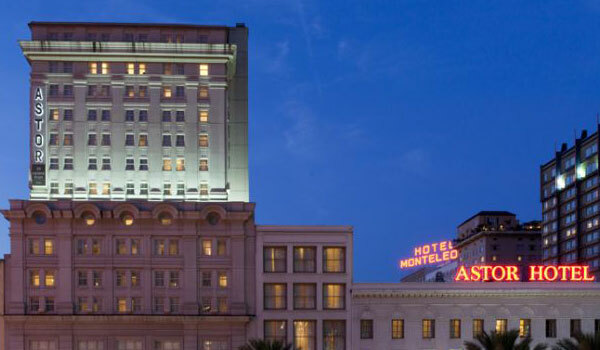 Stationed at the intersection of Canal Street and Bourbon Street, Astor Crowne Plaza New Orleans is ideally positioned near the area's biggest and brightest attractions so you do not need to rent a car. Walk to the Big Easy's most compelling local points of interest, including Ernest N. Morial Convention Center, Harrah's Casino, the French Market and Riverwalk Mall. Discover a vast assortment of tempting restaurants, lively festivals and iconic cultural landmarks, right outside our front door. We also put you in an ideal position to enjoy the area's legendary nightlife, while offering a quiet, tranquil respite after a long, exciting day around town. Bursting at the seams with history, art, music and vibrant entertainment, New Orleans is a magical place with an original culture and way of life. From the music-filled Marigny and the elegant Garden District to the legendary French Quarter and raucous Bourbon Street, the city features a host of unique areas that give it the flavor of an old European capital more than a traditional American city. Enjoy mouth-watering Louisiana fare, countless iconic historical sites and a number of world-famous festivities in this powder keg of energy and fun, where anything can happen and often does. Leave your car and hop on the newly renovated Streetcar for a nostalgic tour of the Big Easy. The line stops right outside the hotel at Canal and Carondolet and forms an arcing railway through the "Crescent City." Visit the beautiful garden district and take in the grandeur of antebellum mansions from the comfort of the cars. Whether you choose a self-guided excursion, scenic carriage ride, pub-crawl or haunted expedition, don't go home without a proper tour of the French Quarter. Popular stops can include Jackson Square, the Historic French Market and Mardi Gras World.